The Arcadia Cross Country team officially kicked off their season this past Saturday with an early morning run at El Dorado Park, followed by a Team/Parent breakfast meeting. Most of the runners have been training all summer to get ready for the Fall season. Nearly 40 runners are participating this Fall. Arcadia Coaches Sarah Boustila and Carl Tichenor motivated their runners over the summer with special awards for logging the most mileage. The Titans opened their season with a dual meet on Tuesday at Notre Dame. The runners head to Flagstaff this Saturday for the Peaks Invitational (hosted by Flagstaff High School). Next week the Titans travel to Campo Verde for a dual meet on Thursday, Sept. 14 and the Ojo Rojo Invitational on Saturday, Sept. 16at Tumbleweed Park in Chandler. The August issue of the Arcadia News featured an article on the Titans cross country team – which is hoping to have a repeat performance in sending its runners to the state meet again this year. 2017 Boys Co-Captains: Luis Cerna, Dallas Greene, Race Tuomisto-Bell. 2017 Girls Co-Captains: Ally Boustila, Sarah Jacobs, Nicole Kaiser. Arcadia Spiritline's Future Titan Night Clinic and Performance has some exciting changes this year - they are offering 2 opportunities to see your Future Titans - once during football season for middle schoolers and again during basketball season for our elementary school fans! So that we can keep the Arcadia High School spirit going strong for years to come, let's encourage our local middle schoolers from Ingleside, Echo Canyon, and all around our neighborhood to come be a part of the Arcadia Spriritline Future Titan Night Cheer Clinic and Varsity Football Game performance! perform right here in Titan Stadium helping the Spiritline cheer AHS's varsity football team on to victory on Friday, September 8th. So ... for all of you Titans, parents, family, and friends who know a middle schooler who may be interested, encourage them to register for Spiritline's Future Titan Night activities and be a part of a great new Arcadia tradition. If you know a K-5 student who can't wait to cheer on our Titans, tell them basketball season is right around the corner and they will get their turn to shine at a special half time show. Of course, we want to see Future Titan students and families of all ages in the stands on Friday, Sept. 8 watching our football team beat Sunnyslope! Go Titans AND Future Titans!!! A NEW Basketball Season Future Titan Night Spiritline Clinic is coming for the first time! Learn material for a game performance highlighting our ELEMENTARY STUDENTS! we will let you know as soon as we have them! MARK YOUR CALENDAR - please be sure to attend these quarterly morning meetings with Dr. Birdwell, SUSD Superintendent & 2 semester evening meetings. District & Arcadia Learning Community updates will be given, and parent attendance is integral part of helping our school receive the attention they deserve. The AHS student film "Orientation" is selected for showing at the Fifth Annual Jerome Film Festival, September 7-10, 2017. The film was directed and edited by Jacob Staudenmaier, written by Lindsay Formica (sound production), and Heather Degroote (director of photography). The students are enrolled in Advanced Film-making taught by ANN & Film Instructor Eric Luse. The film involves a timid man who overcomes his anxiety while navigating his way through an unusual job interview. The Jerome Film Festival was recently selected by MovieMaker Magazine as among the "Top 25 Coolest Film Festivals in the World". More information about the Jerome Film Festival can be found at www.jeromefilmfestival.com. When asked to describe Mrs. Eshelman, students, peers, parents, and teachers responded: icon, efficient, reliable, always available, gregarious, loyal, knowledgeable, best friend, trustworthy, funny, loving, and “mom”. Mrs. Eshelman has two brothers. She grew up in Chicago and moved to Arizona in 1971 to attend ASU. She met her husband, _____ and a graduate of Coronado H.S., while attending ASU. It is clear Mrs. Eshelman loves her job and truly cares about all of “her” students! She makes it a point to meet and learn about every student on campus. Not only does she know all of them, but ALL students know her! She probably attends more activities and Arcadia events than any other staff member: every on-campus sporting event, art show, play, dance, musical performance, and special events like Hopi’s Variety Show, robotics competitions, alumni tours, Lacrosse games and more. She cares about the kids’ well-being, reminding them to make smart choices, and to always be respectful regardless of who the person is. Dog! I’m not home enough right now, but I will get another one when I retire. My sweet dog of 17 ½ years, Blue, passed away last Thanksgiving. I have two daughters who attended Hopi, IMS, and Arcadia. They still live in AZ. The way I deal with people- with respect. I believe: 1. Nobody is any better than another… we all put our pants on one leg at a time. 2. I like to kill people with kindness: you can’t make someone like you, just be kind. 3. Walk away before there’s an issue. Everybody knows everything about me! Oh, maybe: I use to own a Continental Basketball Association Team, Rockford Lightning. Kelley has two daughters at Arcadia and works in interior design. Over the years, she's been Hopi VP of Fundraising for 2 years and IMS VP of Fundraising for 1 year. She has also chaired many committees and spearheaded more events that she can count. Despite working full-time, when her oldest daughter started kindergarten, she made the time to volunteer to be involved in her daughters' classrooms. For her role as President, Kelley thinks being prepared and organized is key. "I'm also a good communicator. I enjoy meeting new people and always up for a challenge. Hoping we can steer this ship in the right direction and to see how far we can move forward." Natalee has a daughter at AHS and a son at Brophy. Her past Executive roles include Secretary and Treasurer. She also enjoyed volunteering for Staff Appreciation. She began volunteering when her children were in a co-op preschool. One of her favorite benefits of volunteering with the AHS PTO is getting to know the faculty and administration and how the school operates and functions. She brings a positive attitude and insight to every discussion, and has been a wonderful addition to the Arcadia family. ADVICE FOR AHS STUDENTS: Your way isn't always the correct way and try being open to new ideas and perspectives. Amanda is a detail oriented person, and lives and breathes AHS. She was PTO President for two years straight (2015-16, 2016-17). Linda has 10th & 12th graders at AHS, and a junior in college. She works as an Occupational Therapist and in geriatric home health. She enjoys being a part of the AHS PTO because "there is an awesome culture at Arcadia and the terrific faculty, staff, and families make it fun to be there. Everyone that works at Arcadia does so much for our kids, it's nice to be able to help out and give back a little." She has volunteered since preschool, but at Arcadia she's given school tours, volunteered with the media comm program, school registration, stuffing envelopes, and helped with Student Government activities. Most of her volunteering has been with Swim and Dive where she officiated, timed, fund raised, and planning parties and banquets. OTHER CURRENT VOLUNTEER ROLES: ​Swim & Dive Booster President, Student Government (son is Senior Class VP & daughter is a Sophomore Senator), Student Ambassadors (son is a VP). ADVICE TO AHS STUDENTS: Make honorable decisions, reach out to people that need a friend, stay involved, and have fun. ARCADIA HISTORY: Her husband grew up in Arcadia schools and graduated from AHS. This is Melissa's first year at Arcadia, with a freshman son. Over the years, she has been involved at ANLC (President), Hopi (Staff Appreciation, Social Media, Webmaster), and Ingleside (President, VP of Communications). She grew up in Scottsdale schools and attended Cochise, Cocopah, and graduated from Chaparral. She is a stay at home mom and enjoys volunteering in the classroom and almost any place that a volunteer is needed. Her niche in technology, and has played a central role in the website development and social media for many of our Arcadia schools. Lisa has two daughters at Arcadia and works in Admin/Marketing for Financial Planner. She helps wherever it's needed, and has been a volunteer for One Lunch, Project Grad, and Registration. One of the reasons she joined the PTO Exec Board is she enjoys working with other parents to make Arcadia a great place for our kids to attend high school. ADVICE FOR AHS STUDENTS: Grades matter, Work hard, have fun. Be nice. Play sports. Get involved. Anne has a 10th grade son at Arcadia and 7th grade daughter at Veritas Prep. She is a Dir of Operations at Ethisphere. She joined the AHS Exec Board for a peak "behind the curtain", and she loves supporting the teachers, students and staff. Her volunteer experience is full of Exec Boards and Fundraising Events: Co-President at Archway Veritas PSO, VP Coaches, Boys Team Charity Exec Board, Hosted Party Co Chair, Night at the Auction (twice), Freshman Class Leader, Brophy Mothers Retreat, Chair Spring Soirée Christ Church School, Founder and Chair, Treats and Treasures, Christ Church School, VP Communications, Junior League of Bronxville, NY. We are so lucky to have her! ADVICE FOR AHS STUDENTS: Be nice and work hard. Tricia has a 9th grade son at Arcadia and 7th grade daughter at Veritas Prep. She joined the board to meet new families and offer support to the teachers, students and staff. Experience: Past Co-President, Social Chair and Community Outreach Chair at Archway Veritas. Veritas Prep Lunch Lead, committee member of past auctions and fall festivals. Volunteer for UMom, Sojourner Center , ChildHelp and Team Taylor-Arcadia Fun Run. Past member of St. Joseph’s Foundation Board of Directors. Current member of Barrow Beyond Neurological Foundation and PCH Leadership Circle. Advice for AHS Students: Be Kind - you never know what someone is going through. 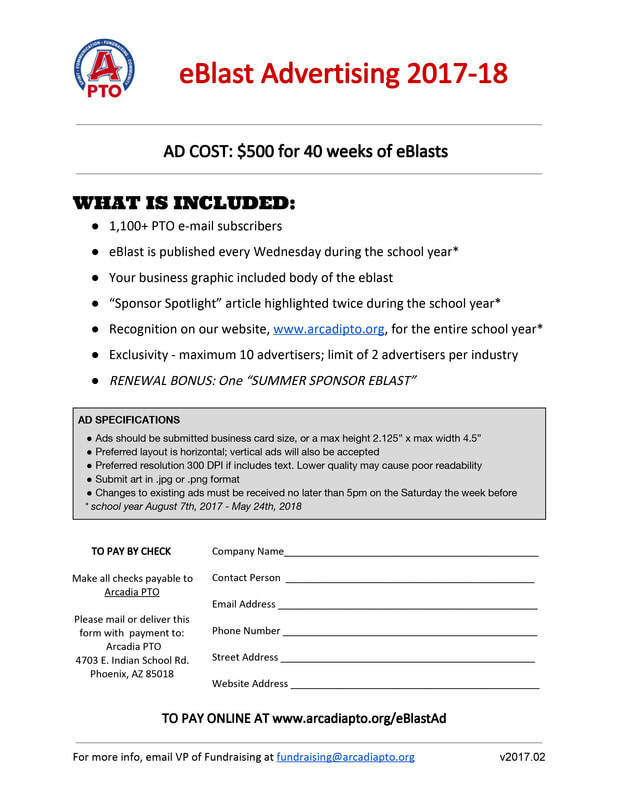 Arcadia's PTO publishes a weekly email blast to all of its 1,100+ subscribers using Constant Contact. The Eblast contains PTO information, Arcadia High School News, Arcadia team & club information, SUSD information, Arcadia Complex Information (Ingleside, ANLC, Hopi, & Tavan), Legislative Updates and local Scottsdale Community Information. Is there a supply list? What does my student need for the first day of school? No, there is not a supply list for AHS as of Fall 2017. Teachers each create their own supply list, depending on their class. Some teachers want their own binder, some don't. ​Be prepared to shop the first week of school! Most teachers give 1 week for students to acquire their supplies. To be prepared we recommend this generic list for the first day of school. There are not any "official" places, but the students have created their own grade level spaces over the years. Where do students buy lunch? Cafeteria for hot & cold food options + drinks. (student ID & cash accepted). Kiosk for hot & cold food options + drinks. (student ID & cash accepted). Cart has salads, cold drinks, and more (cash only). How to I add money to my child's ID? Titan Family Portal - If you need to create an account or add money so your child can purchase lunch with his/her ID go to Titan Family Portal. SEE MORE INFORMATION HERE. ​I need to take the bus, where is it? The buses line up BEHIND the school (on the east side). What school entrance should I use? ​Do not drop students in the front parking lot. The traffic line divides into 2 lines of cars after the front parking lot. Students may exit cars from both lanes once they have turned around the circle. The security guards direct traffic when possible. Please be respectful of drivers and careful of students. Afternoon - parents may park in available spots & your student can come to your car. You cannot exit at Indian School (there are cones & security blocking it). EARLY RELEASE - Call 480-484-6304 so your student is waiting for you. Parent/Guardian is required to walk in and sign student out. LATE ARRIVAL - Call 480-484-6304 to excuse late arrival. It is not necessary to walk in student if you call. FULL DAY EXCUSED - Call 480-484-6300 to leave a message including NAME, STUDENT ID ID#, REASON. TIME LIMIT - Students must be called out/in within 24 hours of absence or it will be marked as unexcused and cannot be changed. Some activities (example: spirit line, dance) have events beginning in May the year before. If you missed those events, please contact the Booster Chair. Some fall sports have events during the summer (camps, meetings), so keep an eye out for communications so you can jump right in. If you missed these meetings, it does not mean you cannot tryout. Some events are important however (Marching Band Camp, Football Camp, etc), and participation is highly encouraged. Tryouts are usually the first week of school. Tryout dates are announced on the morning announcements (ANN - Arcadia News Network), so it's important for students to pay attention if they want to participate. Do you have a question? Leave a comment and we will answer it!